For the past couple years Amazon has followed Henry Ford's maxim on color choices: you could have your Kindle in any color you want, so long as it was black. 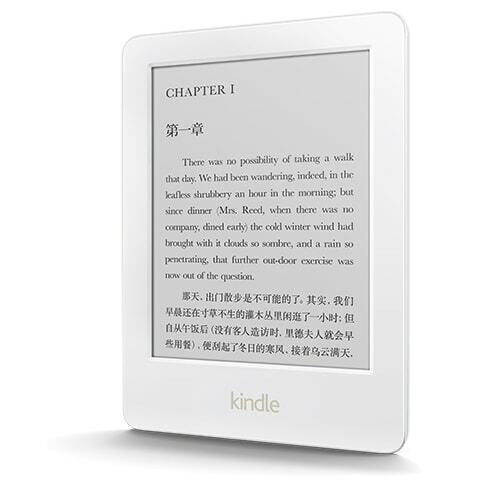 With almost no fanfare, Amazon has quietly launched a new white basic Kindle in China and Japan. The new model is essentially identical to the $79 Kindle Amazon launched last fall, only in a new shell. It sports 4GB internal storage, wifi, an 800 x 600 resolution screen plus a touchscreen, and ties into Amazon's Kindle Store. It has all the same great software as on the black model, and if you don't like the white color you can also order a case in any of 5 colors and 3 prints. The white Kindle is up for pre-order today for 499 yuan in China and 6,980 yen in Japan (that's the ad subsidized price), and is scheduled to ship next Wednesday. Until then, I will be sitting here scratching my head. I'm not just puzzled by the exclusive launch; I also don't see why Amazon launched a white Kindle at all. It's not that black conceals dirt and smudges better than white, but also that there is a valid technical reason for choosing a black shell over a white one. It's a known fact that a black shell will make an E-ink screen look whiter, while a white shell will make it look more gray. This simple fact explains why Amazon first went with a gray shell on the Kindles released in 2011, and then black on all models released in 2012 and later. And now Amazon is bucking the trend. The price is way too high for China, not sure why they even bother if they can’t do half that. That price is not high at all. You are hugely underestimating the average Chinese citizen’t income. There is also a valid technical reason for choosing a white shell over a black one. My new reader has a white shell; my previous reader had a black one. To my surprise, reading with very narrow margins is now more comfortable than before: it’s as if the white shell is the margin of the page, and so a white shell makes the usable area of an E Ink screen larger. Yes, the screen looks more gray, but the frontlight on my reader takes care of that problem. This new Kindle doesn’t have a frontlight, but I can see what you’re saying. It’s a point I hadn’t considered, but now I’m looking forward to a white Paperwhite. If you don’t mind, I disagree here! I use the current Nook Glowlight, along with the basic Kindle Touch, and think the white on the Glowlight really complements the blacks of the e-ink screen (it does help that the Glowlight, in my opinion, has a superior display to the Kindle Paperwhite). If given the chance before purchasing the basic Kindle, I would have chosen a white version, as the contrast is pretty good and the white bezel would work well with the Kindle’s display. I also like the covers for the Chinese Kindle – in my opinion, there needs to be more variety with covers e.g. covers with art prints, e.g. impressionist paintings, or commissioned illustrations (Barnes & Noble were good with their covers, before going in an unfathomable direction with the current Glowlight).